Republican challenger U.S. Rep. Cory Gardner makes point during his senatorial debate with incumbent U.S. Sen. Mark Udall, D-Colo., at The Denver Post in Denver on Tuesday, Oct. 7, 2014. Last month, there was seemingly a large difference between what the national environment and the state polling were telling us about the midterms in November. The generic congressional ballot, a good measure of the national environment, gave Republicans an average 4 percentage point lead among likely voters. Yet Republican candidates in purple states were struggling, with Democrats holding small leads in Colorado, Iowa, Michigan and North Carolina. The friction between the two helped FiveThirtyEight calculate that Republicans held a 59 percent chance of taking back the Senate. There has been little change in that overall forecast –the chance of a Republican takeover now stands at 58 percent. But things have changed. The national environment and the state polling are no longer in opposition to one another. Instead, the two of them have actually converged. They both point to a slight Republican edge. FiveThirtyEight estimates that the generic ballot favors Republicans by 0.5 percentage points. This may seem low given that a lot of press was given to a recent CBS News poll putting Republicans ahead by 6 percentage points and a Fox News poll that had them up 7 percentage points among likely voters. Yet, other surveys tell a different story. A CNN/Opinion Research Corp. poll gave Democrats a 2 percentage point lead, Rasmussen Reports has had Democrats ahead the last two weeks and Ipsos also had Democrats up by 2 percentage points. The national polling in aggregate does not, at this point, point to a Republican tide. That’s not all that surprising given, as I have pointed out, Congress’s low approval rating, which is helping to cancel out much of the effect of the president’s poor standing among Americans. In the purple states, we’re now seeing that Republicans have gained a slight advantage in two of the states that we looked at a month ago. In Colorado, Republican Cory Gardner had only a 32 percent chance of winning, but since then, he has led in more polls than he has trailed. Gardner is currently projected to win 57 percent of the time, a 25 percentage point increase. In Iowa, Republican Joni Ernst had a 45 percent chance of winning a month ago. Since that time, she has led in more polls than she has trailed including the historically accurate Des Moines Register survey. Ernst is now forecasted to win by about 2 percentage points and 63 percentage of the time, an 18 percentage point increase. In two other states, Democrats have gained. In Michigan (which I didn’t cover in my initial piece), Democrat Gary Peters had a 77 percent chance of winning a month ago. He’s now up to 92 percent. That’s not surprising given that the national environment is only leaning slightly towards Republicans and Michigan is the most Democratic of the purple states, as I wrote about last week. North Carolina’s movement is more surprising, given that Mitt Romney won it in 2012. Democratic Sen. Kay Hagan now has a 78 percent chance of winning, which is up from 61 percent last month. Hagan’s chances have risen more over the course of the last 35 days than almost every other candidate running for Senate. All together, the national and state polling is better aligned. You can see this best in other sites’ forecasts. Those that rely only on state polling had previously leaned more towards the Democrats. Since that time, they have shifted towards the Republicans. Every major forecast at this hour gives Republicans at least a 51 percent chance of taking over the Senate. It’s a small edge to be sure, but an edge nonetheless. 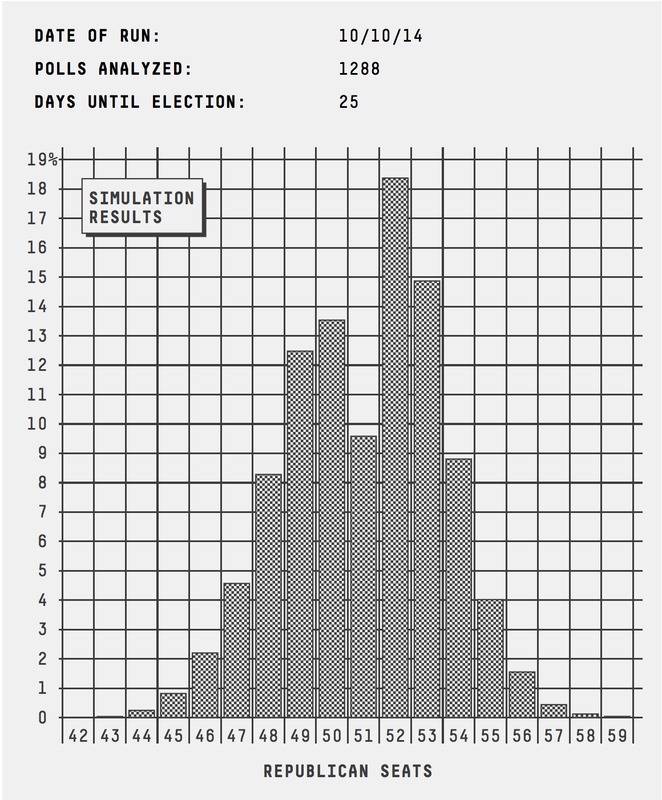 Check out FiveThirtyEight’s latest Senate forecast.